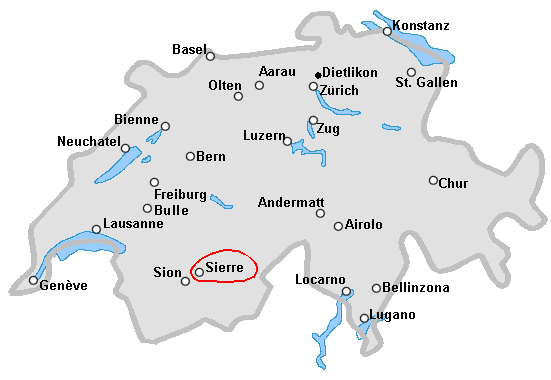 The next Swiss Juggling Convention 2006 will be in Sierre, in the french part of Switzerland. Here is the official information. One side of the information flyer (Only in french. Contains the most nformation). Other side of the flyer (Big file of 546 kb, only in french). - From Friday the 16th to Sunday the 18th of June 2006. - In Sierre, a city of Vallis, in the french part of Switzerland. - In the omnisport center, a nice place in the center of Sierre. Rue du Mont-Noble, 3960 Sierre. - It will be possible to sleep in a camping or in the "protection civile" a king of bunker. Come with a sleeping bag. - Food will be sold on the juggling place. Other possibilities in town. - The participation at the festival is free. It has been confirmed by the organisers. - Dogs are not allowed in the halls. Welcoming the jugglers, from 12 o'clock. The gym opens at 18h30. Public show at 20 o'clock in the omnisport center, followed by fire juggling ... outside. Business Meeting, discussion about the future.